The KLR650 is finally legal; it is registered and insured. 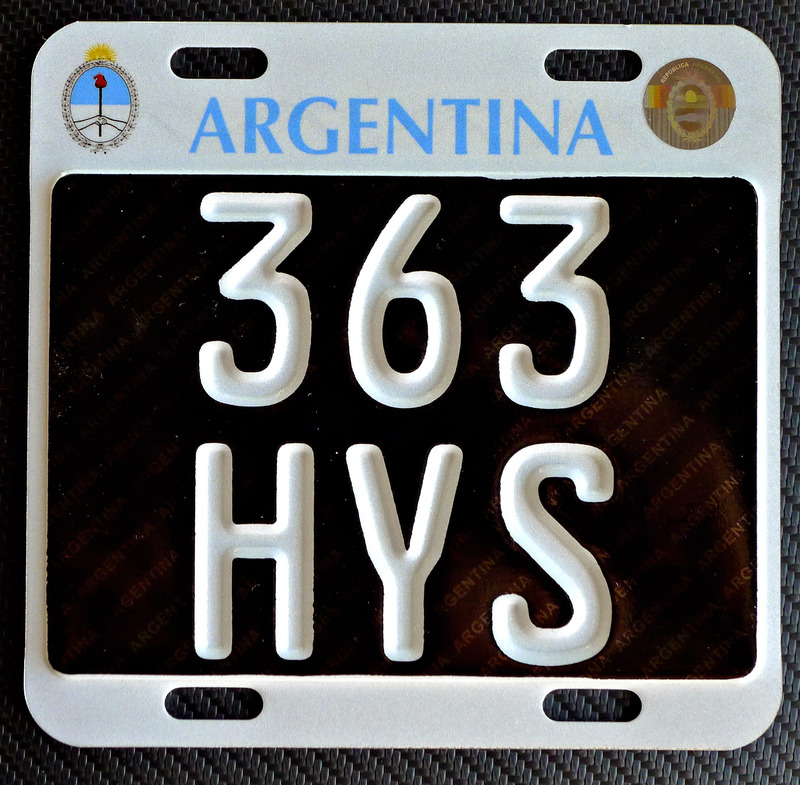 I really like the Argentine motorcycle plates. If you bet on the plate number and win, please donate some of the money to a charity dedicated to either feed or educate children. Yesterday we replaced the stock 15-tooth front sprocket with a Sunstar 16-tooth sprocket secured with an Eagle Mike prevailing torque nut (torqued to 72 ft/lb according to the Clymer Manual specifications and Eagle Mike’s recommendation to follow the KLR manual). Jorge “Pata” Castelli kindly lent us the torque wrench. We had a hard time getting the stock sprocket off until we applied liberal amounts of DW40 to clean some dirt that had accumulated on the output shaft. To replaced the sprocket we followed the Clymer Manual instructions and watched a video from the KLR650reviews.com. I like the way the bike feels with the 16-tooth sprocket installed (my 2009 has one). At speeds of 70 mph/110 kph there is a reduction of about 500 rpm and the bike seems to vibrate less. Apparently the 16-tooth is not great if you do a lot of off-road riding. Hi: I’m so waiting to see photos of when you start your voyage! My family did a similar trip sometime before 1972, starting out from Mar del Plata to Ushuaia! keep up the interesting comments and photos! One of the most memorable of my life. At one point we had a ñandú racing our car! We watched the midnight sun and at the end, stayed in an old light house on the Straits. We actually didn’t make it across the straits, but close enough. I’ll be anxiously awaiting photos, etc.